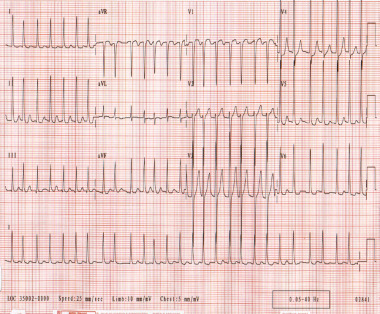 Atrial fibrillation (AF) is a cardiac arrhythmia with the potential to cause thromboembolism. Studies suggest that AF increases the risk of stroke five-fold. Thus, it is important to determine which patients with AF may benefit from oral anticoagulant (OAC) and possibly aspirin therapy to reduce the risk of stroke. First published in 2001, the CHADS2 score (congestive heart failure, hypertension, age ≥75 years, diabetes mellitus, stroke [double weight]) was developed to more accurately predict the risk of stroke in patients with nonrheumatic AF. The index was derived by combining risk factors from prior studies and then testing their validity in a cohort of 1,773 Medicare-aged patients over 2,121 patient years. [3, 4] Valvular AF which is not represented by this study includes the presence of moderate to severe mitral stenosis or the presence of mechanical prosthetic valve.